We've all seen them. The mesmerizing little pyramids on the plains left behind some 75 mya when the huge but shallow Western Interior Sea retreated. This sea once stretched from the Gulf of Mexico to Hudson Bay. It was only 200-400' deep, and it ran right through Fremont County. These head-turners, called Tepee Buttes, are not random nor barren. They offer an insight into ages past when marine life found the hydrocarbons at their core life-giving. 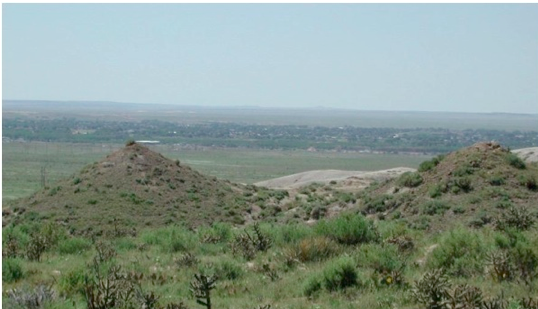 Fremont County has its own Tepee Buttes on private land, though there are more well-known Tepee Buttes east of Pueblo near Baculite Mesa and near Boone (where over 50 buttes cover 1.5 square miles). Mt Pleasant, better known as Spud Hill, in eastern Canon City was a Tepee Butte before being bulldozed, and was a local source of many back garden ornaments. Excerpt from The Cañon City Daily Record, Yesteryear by U. Michael Welch, Used with permission. Looking at the surrounding mountains, there is a mystique about various shapes, especially the ones steeped in legends. The most notable is Fremont Peak to the west of Cañon City. Where locals are aware of and visitors can see an outline of a sleeping Indian on the horizon. As to legend, Cañon City was once the spot for Native Americans to spend the winters, where they bathed in the hot springs, searched for comfortable shelter and hunted. One year the Utes were camped near the river when a band of Blackfoot Indians came into the area. While living in the -area, the Blackfoot braves could not find enough to eat, and they noticed there was food hanging in the Ute encampment. Reprinted here by permission from Bob Carnein. Also published in the LGGMC September 2015 Newsletter. Phenakite (aka phenacite; pronounced feen’-uh-kite) is a rare beryllium silicate mineral (formula Be2SiO4) that occurs as excellent crystals at several Colorado localities. For the beginning collector, it’s one of the most difficult minerals to identify, commonly being confused with the much more common quartz and topaz. This article is designed to help you to recognize this elusive and often overlooked mineral. Reprinted here by permission from Mike Nelson. Also published in the CSMS July Pick and Pack. DISCLAIMER: THE FOLLOWING IS MY OPINION AFTER READING, AND TRYING TO UNDERSTAND, PART 291 PALEONTOLOGICAL RESOURCES PRESERVATION RULES EFFECTIVE MAY 18, 2015, AS PUBLISHED IN THE FEDERAL REGISTER.